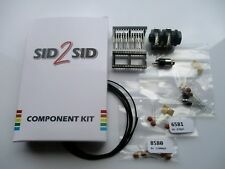 Commodore 64 SID2SID 6581 & 8580 Parts Kit. 4x 470pf (471) Capacitors for 6581 SID. 4x 22000pf (223) Capacitors for 8580 SID. 1x 2N3904 for 8580 R5 SID. Parts Kit Includes -. & 6.35MM Jack socket with suitable wire. The Tapuino Reloaded is a hardware level Datasette emulator for the Commodore C64, its designed by the team who produced the uCassette. - Compatible with C64, VIC-20. Rambo: First Blood Part II. With this device you can load tape images (. ). Spy Hunter. Works fine. (UK Mainland only). Biete einen Set aus einenagelneue A3660 Platine 060 CPU Sockel. Ich ermutige den Käufer, die verschiedenen Amiga-Foren. und hat sich vor dem Verkauf zu 100% bewährt. Die Platinenrevision ist 1.1. und Websites nach Unterstützung zu durchsuchen. 2X Atari 800XL Computer Still NEW in Box (Priceless). ATARI 7800 NEW in Box (Priceless). ATARI 2600 (Sears) Rarely played (Priceless). OWN A PIECE OF ATARI HISTORY. Mark your calendar.Set your Alarms. NANO SWINSID, CON QUESTO CHIP POTETE RIMPIAZZARE IL SID GUASTO DEL VOSTRO COMMODORE 64 O 128. è POSSIBILE SOSTITUIRE SIA IL SID 6581 CHE 8580. New - Commodore WiFi 64 modem & Top Cards BBS Set. New from the developer of uCassette is a smart WiFi Modem for the Commodore 64. Plug it into your C64 and start calling C64 BBS Systems again. There are also a couple boxes as well as a bundle marked “Blank”. 1 x AMiVGA adapter. Connect your Amiga computer to Multisync VGA monitor! Notice: If you don't want to usenative Amiga resolutionsyou can use your Amiga with almost any monitor. Amiga AMi VGA. Adapter doesn't fit in Amiga 4000 ! When Commodore first released the 128D we got one, opened it up, and took a good look. It didn't take long to discover one MAJOR difference. The standard C-128 has just 16K of video RAM, while the newer 128D has a full 64K. In 1990, Wesley J. Wiese produced a really nice circuit board design to go with those plans. This is an updated revision. Beyond 512k Module only, no REU or RAM etc, PCB only. MacCon Card-01. 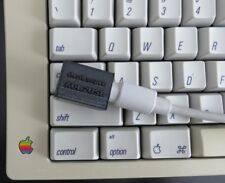 For sale is a working ethernet adapter for the Macintosh SE/30 or IIsi. Includes the card, cable and interface board as pictured. While many cards for the SE/30 and IIsi are interchangeable, the SE/30 design constraints call for a tight fit. This is the best of the best to run all type of platforms. Because, recently there are a lot of boards that they make just Emulation of the platform. DE10 uses Linux for house-keeping duties such as loading data from the SD card. (Also, RISC OS on a 700MHz ARM really flies!). Raspberry Pi running RISC OS 5.20. RETRO ALTAIR 8800 S100 Computer ARDUINO CLONE. The use of the two right hand AUX switches selects one of the many functions and even includes an interactive on-screen 8080 assembly language debugger. LumaFix64 designed by e5frog and manufactured by Shareware Plus. LumaFix64 was made to easily remove vertical lines from your Commodore 64 image caused by signals also in the VIC-II video chip. Enjoy image with less stripes. Here we have a useful little device for Amstrad CPC464 owners. The two joystick ports are offset for easy access to the audio-out jack. This is the best design of it's type, with three fire-button support. Mister FPGA SD 256mb Ram Board, Snes, Nes, Turbo Graphx, Neo Geo. 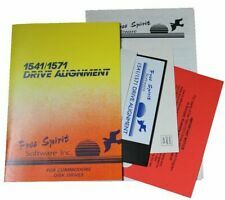 SURF SQUIRELL PCMCIA / SCSI ADAPTER FOR THE COMMODORE AMIGA A1200. AIWA ACD-300 CD ROM THESE ARE VERY SOUGHT AFTER. THIS CD ROM IS IN LOVELY CONDITION AND WORKING FINE. Soccer Q- case vgc, label on tape looks copied- instructions included. Soccer Boss- case gc, small scratch on front of case middle- instructions included. Jimmy's Soccer Manager- case vgc, minor discolouration- instructions included. Single Sided Single Density, these were the first floppy disks ! The Running Man. Works fine. (UK Mainland only). The LED changes from Green to Red when tripped. Apple Macintosh System 6.0.8 (1988) Floppy discs, one with System 6 and the other with a collection of useful applications and utilities (see image), including famous Apple Speak Condition is new. Please note: these are not original Apple discs but copies. Dispatched with Royal Mail. Ninja by Mastertronic - C64/128 Atari 800XL/130XE - Vintage - Tested & Working!! Commodore ~ 1084S D1 ~ Colour Stereo Monitor ~ Tested & Boxed. Includes Polly’s/Manual/Power Lead & Monitor Cable’s Dispatched with Parcel Force 48 Please see screenshots Thanks for viewing No returns Kindest regards Space-invaders Have fun Enjoy! AudioEX 2.0. FM Radio Module 5807 For the Commodore 64 & 128. Simply plugs in your User Port and you can listen to the radio on your 64 and 128! FM RADIO v2.2. 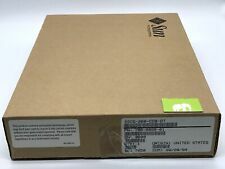 TI 99 4/A - TI Extended Basic Retail package: Box, Manuel, Cartridge. This is an original TI Extended Basic retail package. It was used yet loved by this vintage computer enthusiast. Includes original box, manual and cartridge. The cartridge works and is 100% guaranteed tested! The manual has no yellowing and can be seen via photos. The box has a small tear in the back. Clearing my collections, to buy new stuff! CONNECTED TO MY A500 AND WORKS FINE. 68030@40 MHZ AND FITTED WITH 2 X 1MB RAM. It does not use an analog phone line but internet through a wifi connection. Behaves like a Hayes dial-up modem, and it is designed and built for old computers; I use it with my first computer ever (still working!). For the Sinclair Spectrum & ZX81 Computers. Good quality 56 way edge connector (28 top, 28 bottom), exactly fits the pitch of the Sinclair Spectrum and ZX81 edge connector. Has short solder pins for connection. VGA adapter to connect a SVGA /Multiscan monitor to the Amiga RGB port. This is fully buffered. for A500, A500 , A600, A1200 or "big box" Amiga systems (not A4000). These modified connectors will fit the Amiga's video port without any problems. NEW!! Tseng Labs ET4000AX ISA Video Graphics Card 1MB 16bit, Latest design!! 1MB of 70ns DRAM standard. Compatible with ISA Bus Systems including ones. Fastest DOS performance of any ISA card. These boards are new, unsold inventory from a Micro-Labs factory production run which occurred around the year 2000.